The first annual PHP Australia Conference will be in Sydney in 4 weeks ! Don’t miss this exciting event ! I was able to invest time on improving the UI and adding new features to fxalert.net. Fxalert.net is a web application allowing to create simple and advanced email and SMS alerts on the forex market. It supports more than a 100 of currencies pair. I hope people will like and find useful this new version. I recently developed for fun a webapp offering forex currencies alert. 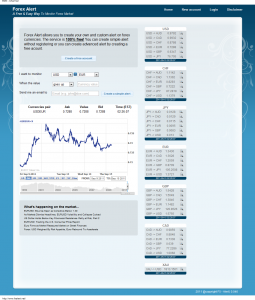 It allows users to create 100% free custom currencies alert on approximately 100 currency pairs. Alerts are sent by email for now, but others channels will be available soon such as SMS, IM. You can check it out at www.fxalert.net. As a consultant, I often need to use web conferences and since the old DimDim days were over, I started looking for a new one. After doing some searches and tests, I discovered Mikogo. Their features list is pretty complete and wide. It is a completely free (without any ads) service. I did some tests and it works really good. So, if you were like me, looking for a solid and free web conferencing service, I highly suggest you to try it out. By spending some time reading their forums, it seems they have a nice community of users also. PHP Québec, Montréal-Python, Montreal.rb, W3Qc and OWASP Montréal are proud to announce the second edition of the ConFoo Conference. From March 9th to 11th 2011, international experts in Java, .Net, PHP, Python and Ruby will present solutions for developers and project managers the prestigious Hilton Bonaventure Hotel, located in downtown Montréal.